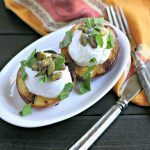 Grilled Nectarines with Greek Yogurt, Pistachios and Mint. A quick and easy low carb and sugar-free summer dessert that will impress everyone. Can we just talk about this dessert? Seriously. It’s freaking amazing and totally free of sweetener of any kind. You just don’t need it. And, it’s impressive to look at. You can even grill the nectarines ahead of time and you could have a group dessert plated in less than 5 minutes! When it comes to summer, I am all about grilling. One of the things that I was most excited about for our new house (besides the huge kitchen pantry!!) was getting a new grill. Our old one lived a good life but needed to go to the grill graveyard. This time around, we knew we wanted to get a large, high-quality grill that would last for years to come and could be installed into an outdoor kitchen in the future. We investigated a number of high-end, luxury grill brands and decided to go with Coyote Outdoor Living. DISCLOSURE: This post is part of a series of posts sponsored by Coyote Outdoor Living. Coyote Outdoor Living has compensated me for my time to develop this recipe. Thank you for supporting the brands that make EverydayMaven possible. All opinions are my own. This is the 42″ S-Series Model with optional cart. It’s a beast. It has some really cool features like infrared burners for a Rotisserie (which we got! ), a RapidSear Infrared Burner for high-heat searing of steaks and chops and even interior lighting as well as back-lit control knobs. We also opted to get the Signature Grates which are so beautiful I almost didn’t want to cook on them and get them dirty. The one with the widest slats is for Beef and Pork, the medium slats for Chicken and the other plate is for Fish and Vegetables. They are amazing and totally worth the upgrade. And, I’m super excited to announce that I have partnered with Coyote Outdoor Living for the rest of 2016 to bring you a series of fantastic grilling recipes! To start off, I felt like I needed to ease into cooking on this beast and really learn it and its capabilities. Grilled peaches and nectarines are always a favorite and this dessert developed organically one night after grilling a bunch of fruit and vegetables as a test. We have made it 3x since! If you want to add a little extra sweetness, use Vanilla Greek Yogurt or add the slightest drizzle of honey before adding the mint. Either way, I think you are going to love this! Peaches or large Plums could be substituted for Nectarines. I highly recommend Greek yogurt as it is thick, will hold its shape and has a tang that pairs really well with the grilled fruit. Make sure your grill grates are CLEAN so your fruit doesn’t wind up tasting like burgers or fish or whatever you last grilled! Slice nectarines in half and remove pits. Turn each half over and slice a small piece off of the bottom so that the nectarine half will sit flat on the serving plate. Rub the avocado oil onto the sliced nectarine halves (both sides) and sprinkle with sea salt. Once grill is hot, grill peaches about 3 to 4 minutes on each side with lid shut. You want the grilled peaches to be tender but not mushy. Remove and allow to cool for 5 to 10 minutes. Top each half with 1 tablespoons Greek yogurt, 1 teaspoon shelled pistachios and a bit of chopped mint. Serve immediately and Enjoy! TIP: Make sure your grill grates are clean so that your nectarines don't take on the smell of whatever was last cooked! Grilled fruit is so great, isn’t it? Love it in a dessert! Or salad. This looks terrific — thanks! Looks Luscious, Easy, & Healthy. Can I use peaches instead ? My peach tree went crazy this year full of organic peaches..
I’m so impressed with The Coyote Grill. I wrote the company to ask for a brochure. Do you take the Grates off and hand-wash them after every time you grill ? If so, what do you use to wash these? Absolutely — peaches or even large plums would be great. Great questions about the grill. We are using a (bristle free) grill scrubber to clean the grates while they are still hot and then “deep cleaning” them 1x a week by removing and using Dawn and hot water. Hope that helps! Your idea to slice a tiny bit of the bottom of the nectarine so it sits flat is fantastic. I e had so many ‘collapses’ with things like this before – and such a simple answer – why didn’t I think of that? Plus tummy Tis bits for me!! !